Two artists “missing” – from credits! Half songs previously issued under different album title! Welcome to the Wild West (coast) of music publishing. Like, Wow! 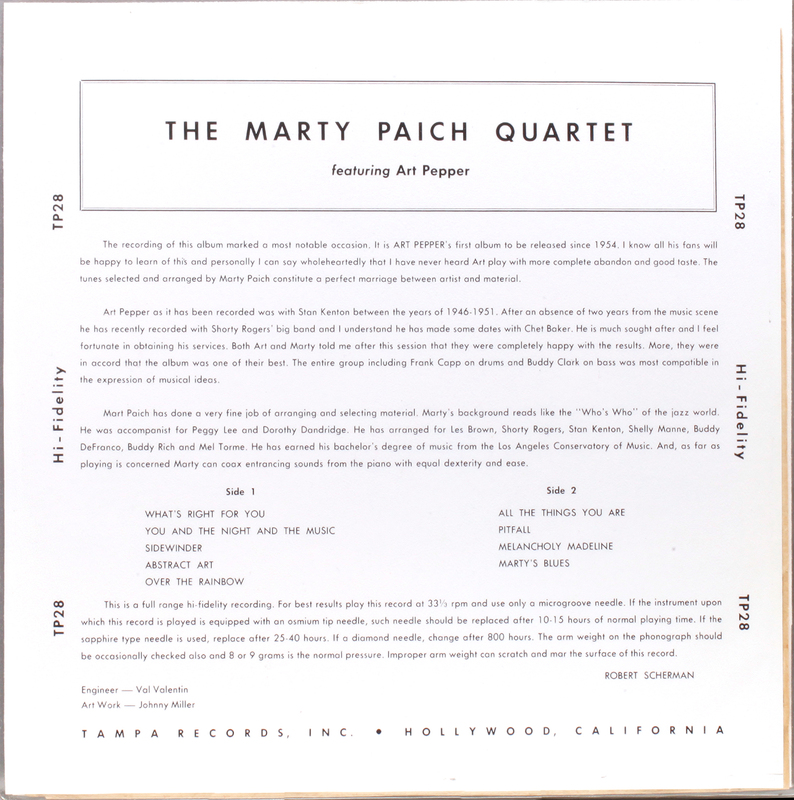 Selection of four recordings by Paich without Art pepper but with guitarist Howard Roberts and Larry Bunker (vib) – no mention in credits – taken from Tampa LP 10″: TP 23 — Hot Piano (1956) and four recordings with Paich and Pepper which overlap the famously rare Tampa 10″ TP 28 Marty Paich Quartet featuring Art Pepper, straight out of The Big House. 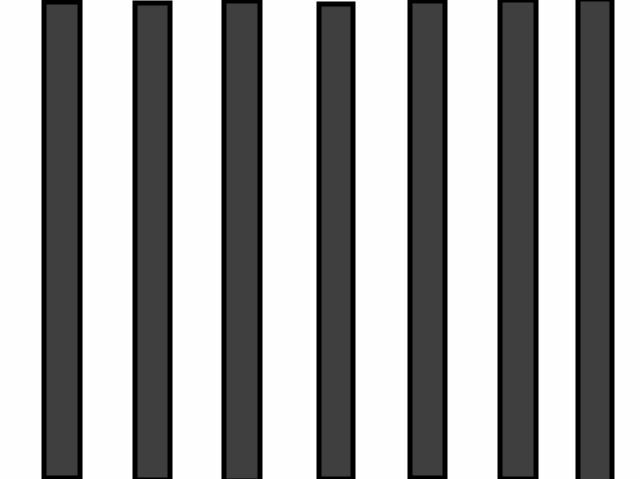 You can imagine Pepper’s car back-window stickers, a Cook’s tour of the American penal system: Terminal Island Federal Prison; Los Angeles County Jail, San Quentin, Syanon. Quite how these 1956 recordings emerged on Interlude labelled “1960 Jazz” remains a mystery. Light as air, Pepper breezes through the songs, a free man. His sweet measured tone is quite unlike any other, and happy melodic flow is impossible not to like. He remains the voice of West Coast jazz (though at his very best when united with an East Coast rhythm section). After reading a couple of jazz biographies , including Pepper’s Straight Life, I resolved not to read any more. I don’t require musicians to be heroes, role models, or saints. A musical talent is not necessarily attached to an admirable or noble person, and knowing more about the person and their passage through life doesn’t deepen your appreciation of their music. Only listening to it can do that. Pepper is a pleasure to listen to, that’s as much as I need to know. 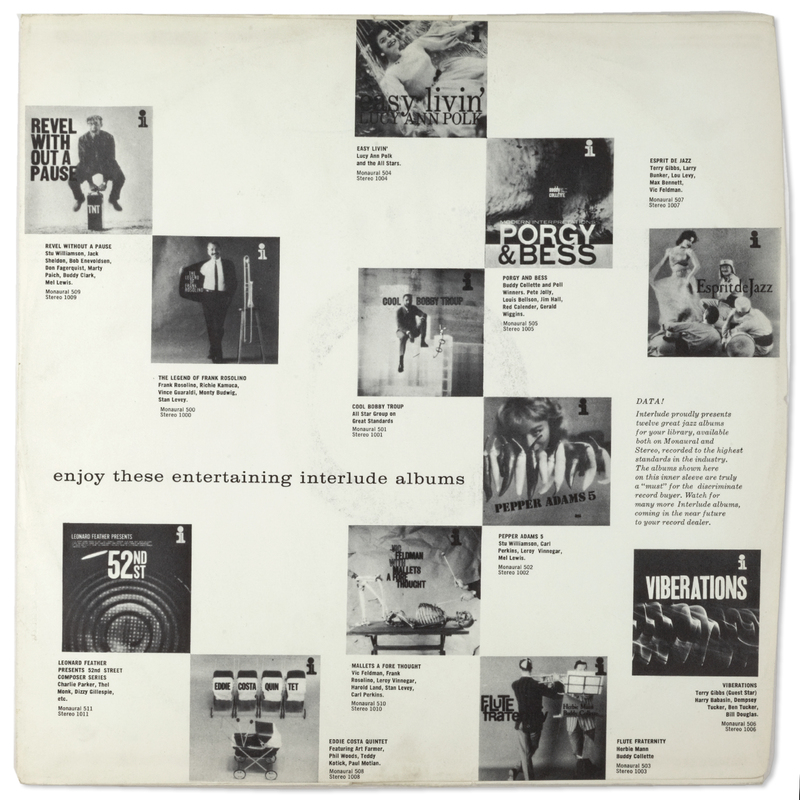 Corporate inner sleeve (1960) explains monaural dimensional realism. “Close your eyes and you may well believe the artists are performing solely for your entertainment”. As I like to say (55 years later) – “musicians in the room”. Unlike the slightly dodgy audio performance of the Tampa original ( or so I am told), the Interlude is a sonic joy. No mention of monaural dimensional realism, no mention of the engineer by Interlude, but the engineer is unmasked on the Tampa notes as no less than Val Valetin – Luis Pastor “Val” Valentin – later legendary house engineer of Verve, whose jazz discography is up in the hall of fame with Rudy van Gelder, with whom Valentin worked on many Verve recordings. Explains how a 1956 recording might sound so sweet. Source: collection of a very serious Art Pepper fan, one of twenty or so records that had come into a West London store, all mostly unfamiliar Japanese titles from the ’70s – except this. Had me fooled. 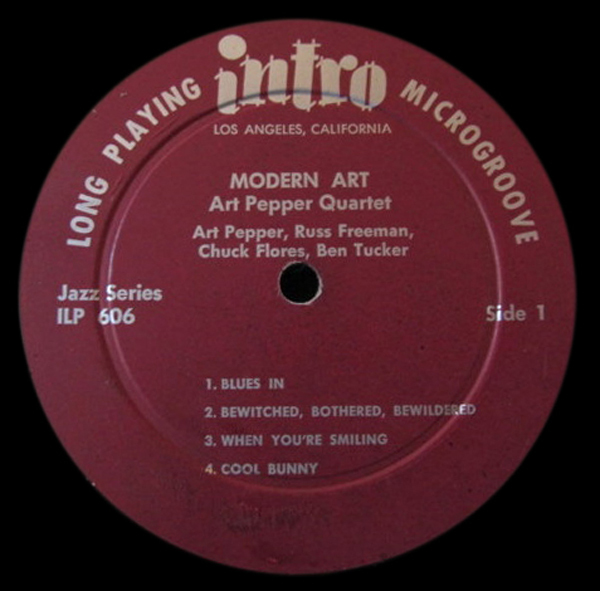 “Jazz 1960”, guest Art Pepper, deep groove, unknown Hollywood label, tunes from different albums, Springtime for Pepper, and Valentin. Well, half the record was new to me. So it sometimes goes in record collecting. You think you know a lot, but a lot of the time you don’t know very much at all. Another “girly cover”. 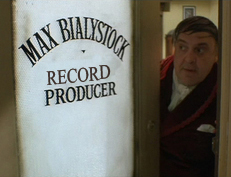 “Surprising someone in the shower” seemed a recurring 60s bachelor-pad theme (until given a bad name by Alfred Hitchcock). This entry was posted in Art Pepper, Interlude and tagged Art Peppper, Interlude, MartyPaich, Max Bialystock, Tampa, Val Valentin by LondonJazzCollector. Bookmark the permalink. Art is the absolute best. His choice to use opiates, something that would have been unremarkable in the 1880’s, solidified his identity as an outsider unwelcome in larger soc’ty without repentance and reform. This is an identity that can feed the sophisticated spontaneity of jazz, and of expressing difficult to articulate emotions brought on by rejection of larger soc’ty who cares not to spend time understanding. Criminal his life and career were cut short bc he couldn’t/wouldn’t abstain from the ancient practice of opiate consumption; 50 years prior regulating what an individual could personally consume was considered unconstitutional. 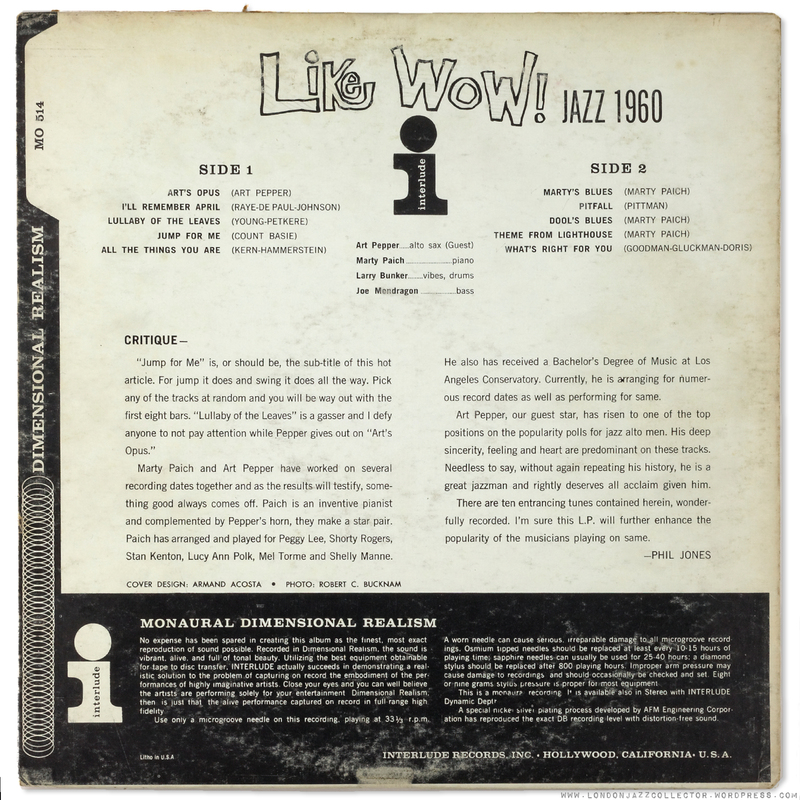 The album Like Wow on Interlude released for 1960 is actually tracks from Tampa 28 and another session. If we judged on everyone’s problems with substances there wouldn’t be anything to listen to. I forgot to mention about the quality of sound on the Charlie Parker Records Collection. I don’t know what the original Art Pepper & Mary Paich Quartet Charlie Parker Records LP sounds like, but the remastering on the CD is excellent. Sound is well-balanced and everything comes through beautifully. In addition to the Pepper CD, to date, I have only listened to several Lester and Parker CDs, which I was already familiar with in other formats. Compared to the sound on the original LPs, the CDs are improved. At a 30% discount, I paid less than $30.00 for the set, which I consider a good buy. I have the London 10″ vinyl of Marty Paich feat Pepper – I’m sure I paid £10 or £20 for it – can’t quite remember. The record has such a great sound for a 10″ as does a Milt Jackson Esquire 10″ from 1954 I bought for a small fee again from my LBS – of course that’s an RVG job. Strangely, as I remember, Art Pepper was an artist frequently played on John Peel’s show in the 1980s but to my annoyance he never played anyone else – Coltrane etc. I watched a YouTube clip of his performance on Jazz Casual but he sounded completely different at that pt in his career after many rough turns in his life and sadly nothing like he did on the above sample…. When Art Pepper was freshly released from San Quentin Prison in 1964 at the time of Jazz Casual he was playing a club in Oakland with that group..Ralph Gleason was always a great supporter of great Jazz Talent and of any musical talent he felt needed more exposure to the public. Pepper had become influenced heavily by John Coltrane and was showing that on all the tunes except the last one as the credits rolled which was more of his own personal sound. Many of his old friends..Shelly Manne, Shorty Rogers, Stan Kenton amd later Buddy Rich who he did a short stint with were telling him he should scrap the “new” sound and play his own sound that was really him..and he did. Watch him on youtube in the film that he appears in just a couple months before his death and posthumously released Notes From A Jazz Survivor, it’s personal and shows he was playing in top form! Thanks for the tip. I’ll be sure to check it out. Glad you hear a number of his musician friends influenced him towards ditching the ‘new sound’! Pepper was recently release from San Quentin prison at the time of the Jazz Casual appearance. He was performing with this group in Oakland and Ralph J. Gleason wanted to help him with some exposure. At this time Pepper was influenced greatly by Coltrane. The last tube at the end credits is Pepper’s own sound. Many people who knew him advised him that he should be himself. Rudolf I agree. The discovery sides are really great. I was lucky a few years ago when I was able to buy the British vogue 10″ issue ( L,D.E. 067) of discovery 3019 in near mint condition. Sound quality is amazing when played on a proper mono system. Do you have the original pressing ? What about the sound quality ? Jan, I have the 1953 Discovery material (# 3019 and # 3023) only on a Savoy re-issue entitled “Surfride” MG 12089, and remaining titles on Regent MG 6069. The mastering is by Rudy van Gelder. The sound is O.K. but your Vogue pressing no doubt is better. Vogue L.D.E. 067 was issued in France by Jazz Sélection 50.005. The Regent album is dedicated to two altos: Art Pepper (remaining Discovery tracks) and Sonny Red (Kyner). The Sonny Red session is a cooking Detroit session anno 1958, but recorded in Chicago, with Pepper Adams, Doug Watkins and Elvin Jones. Long tracks of great hard bop. I also gave up — swore off, is more accurate — Pepper’s autobiography. I found that knowing that the man was a monster who despite this played airy, breathy, mellifluous alto which seems (most of the time) to shine with good feeling didn’t really deepen my appreciation of his music. It simply made me wonder how it ever happened. It says something I suppose about the enigma of the human condition and about artistic creation, but I certainly didn’t need 600 pages of it. Much the same could be said of Pepper. A phrase worth remembering, Alun, perhaps more insightful than “Bird Lives!”, a claim contradicted outright by his autopsy. What I have found enthralling – was it you that recommended it? – is Whitney Balliet’s collection of 46 pieces “The Sound of Surprise” (Pelican 4/- 1960) Every page is worth the price of admission. Can that man write, puts me to shame. I think perhaps it was, LJC, yes — I have the collected writings on jazz 1954-2000 that Granta published some years back. It’s huge and there’s always something fresh to discover. Saturday afternoon and time for something completely different. Dollar Brand and Johnny Dyani’s ECHOES OF AFRICA (Enja 1979) and now Paul Bley, Tony Oxley and Furio Di Castri (what a name!) on CHAOS (Soul Note 1998). It’s fantastic. Some tracks are trio pieces, some piano solo, and some Oxley percussion pieces. And it isn’t ‘chaos’ — it’s careful, controlled, sparse. If you like Oxley — one of the greatest of free jazz drummers — he is particularly well showcased on this recording. I wish I could find it on LP, but perhaps it was only ever issued on CD. If anyone knows, leave a comment. Listening to records in bed. Now that is decadent. Intro, Intro, Intro, someday I’ll get my hands on you. Test your knowledge of figures in public life, in the late ’60s, courtesy of Viv Stanshall’s Bonzo Dog Doo Dah Band. I understand that Fredrik has a copy of this one of course….can’t recall exactly but I think the most recent auction for this title ended around $800 or so, yikes! Thankfully those sides are present on the BN twofer, “Early Art”, but alas that’s not quite the same eh?!? Aggh, I have Early Art. Keep stirring the pot, this story is not over yet…. It’s a great record, one of my favorites by Pepper. I have a few Peppers left to try and get. The early stuff he did is superb, I think. A talented altoist, for sure. He was special. Nice find! Congrats. Do I understand that LJC is the proud owner of the 10″ Tampa and London albums? If not, the companion album to Interlude 514 is Interlude 512. If you have these two, Tampa 28 is in the house. I never managed to find a decent copy of Tampa 28, so I am sticking to the two Interludes which cover the Tampa session. 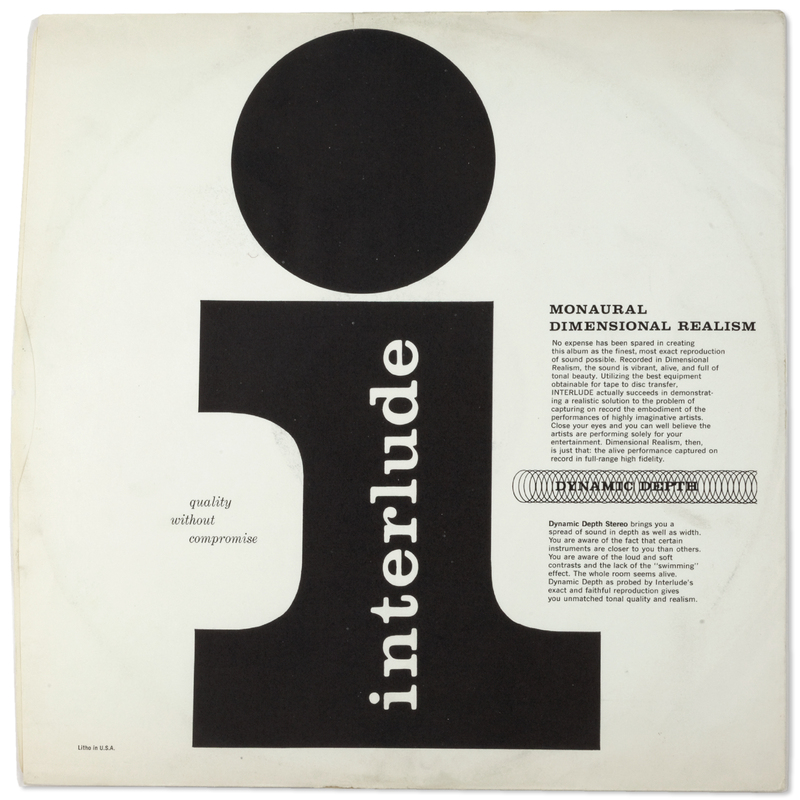 Interlude also re-issued Mode material. They were absolutely horrendous for their art work. And putting a 1960 date on a 1956 session did not bother them at all. 512 is entitled “Pepper Pot” and shows a young lady in a sort of bathing tub with a green pepper in her hand. Very funny indeed. Interlude was later re-baptized IRIS, my 514 has IRIS stickers on the Interlude name, but authentic IRIS labels. Thank you for the “inside track” on the Tampa pair. I have the London 10″ but not the Tampa. I’ll keep an eye out for more Interlude, but take anything they write with a pinch of salt. 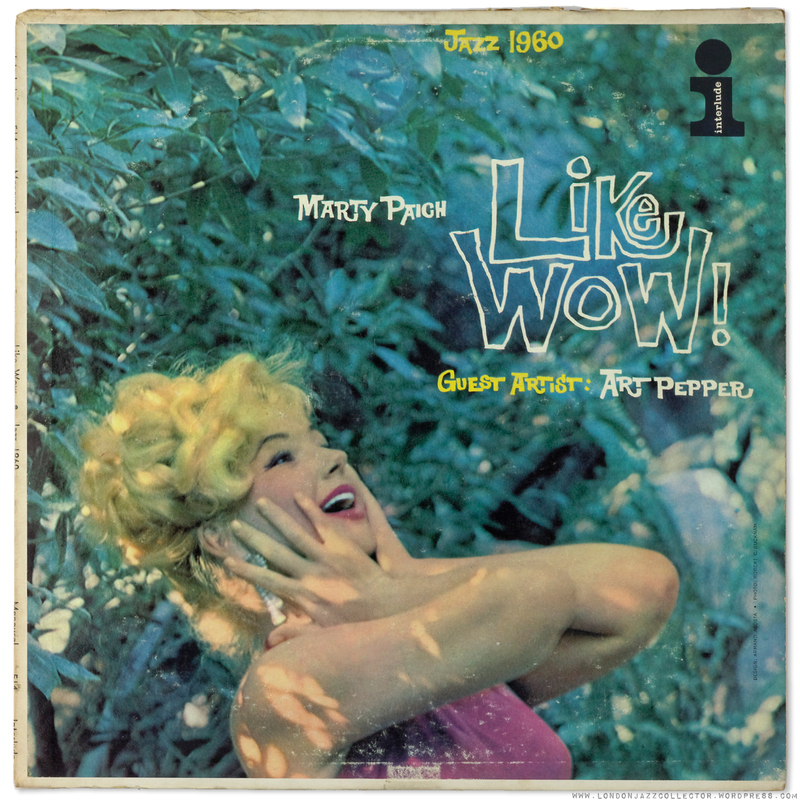 I think 1956-60 were Pepper’s golden years – Gettin’ Together, Meets the Rhythm Section, Smack Up, all get regular play. Later works somehow don’t sparkle the same way, though I can’t exactly put my finger on why. to have the London version is my dream. It is nicer to have the original session in tact on one disc, rather than scattered around on Interlude/IRIS with dubious art work. And then, of course, London is Decca, crème de la crème! Agree with your golden years 1956-60, but the 1953/54 Discovery sides were also lovely (re-issued as “Surfride” on Savoy). A hidden Pepper, excellent this one, is “Just Friends” on Pacific Jazz, issued under Bill Perkins’ name (one half with Pepper, the other half with Kamuca) 1956. Strongly recommended. Meets the Rhythm Section is one of my all time favourites.